SAUDI ARAMCO, the world’s biggest oil company in terms of oil reserves and production, plans to build refineries in China and Indonesia as part of a $200 billion spending programme to double refining capacity and explore for oil and natural gas during the next decade. The national oil company of Saudi Arabia is going ahead with a refinery in China and is still waiting for “good terms to be put on the table” for a processing plant in Indonesia, according to president and chief executive officer Khalid Al Falih. The oil giant has already decided on investing in expanding a plant it operates with Japan’s Sumitomo Chemical at Rabigh, he says. Aramco, the world’s largest crude exporter, is also expanding refining and petrochemical production to meet domestic demand and export refined products that can fetch higher prices than oil. The company plans to boost its global refining capacity to 8 million barrels per day (mbpd) in 10 years, including projects yet to be announced. “It’s an aspiration for a longer-term growth objective,” Al Falih says of the refining-capacity target. Aramco also plans to invest in drilling for oil and gas inside the kingdom and in petrochemicals production and other downstream activities, he says. The company is exploring for unconventional gas, including shale and tight gas, in the nation’s northwestern region, Al Falih says. Low gas prices are a “challenge” to developing these hard-to-reach deposits, he says. Aramco’s capital spending will probably rise to more than $20 billion a year if it develops unconventional gas, he says, adding that the company will invest $90 billion in the next five years to increase refining capacity by 50 per cent to 6 mbpd in projects. Refining capacity in Saudi Arabia itself will rise to 3.46 mbpd in 2016 from 2.26 mbpd. Saudi Arabia’s crude oil production rate currently was around 10 mbpd, according to the Organization of the Petroleum Exporting Countries (Opec). Most of the capacity to be added to the five-year target will be at refineries in Asia, with the bulk of that in China, Al Falih says. Aramco seeks to tap increasing consumption in China, Asia’s biggest energy user, by forming joint ventures with local partners. According to Frost & Sullivan, a growth partnership company, Saudi Aramco’s growth plans are clearly aligned with the diversification objectives of Saudi Arabia. Saudi Aramco, through its joint ventures such as PetroRabigh, Sadara Chemical Company and Satorp, is introducing a whole new array of products that were not previously produced in the GCC. These chemicals not only add more value along the petrochemical chain, but also open investment opportunities in the downstream sector and ultimately create more job opportunities for the local people. On the strategic side Saudi Aramco is discussing a plan to extend its operations into more than 50 countries in the next 10-20 years. “We want to transform Saudi Aramco from a leading oil and gas company into a fully integrated, truly global energy and chemicals enterprise with extensive operations in the kingdom and around the globe,” says Al Falih. Aramco operates outside Saudi Arabia now mainly through downstream joint ventures and interests. The strategy described by Al Falih, although lacking details, sounded more like those that have made national oil companies of other countries strong competitors for global oil and gas investment opportunities. As the holder of reserves estimated at 260 billion barrels of crude oil and condensate and 275 trillion cubic feet (tcf) of natural gas, and with production capacity of 12 mbpd, Aramco has formidable financial strength. Al Falih says an initiative called 2020 Strategic Intent envisions that by 2020, Saudi Aramco would have become “the world’s leading integrated energy and chemicals company, focused on maximising its income, facilitating the sustainable and diversified expansion of the kingdom’s economy, and enabling a globally competitive and vibrant Saudi energy sector”. Aramco says the intent is to become “a truly global company with operations in over 50 countries”. Describing itself as “a consumer of the best technology” now, it says it will become “an innovator and producer of leading technologies”. Long an oil and gas production powerhouse, Aramco entered the petrochemicals business in 2009 with the start-up of the PetroRabigh petrochemical complex integrated with an upgraded 400,000 bpd refinery at Rabigh on the Red Sea. PetroRabigh, a joint venture with Japan’s Sumitomo Chemical Co Ltd, can produce 1.3 million tonnes per year (mtpy) of ethylene and 900,000 tpy of propylene. Echoing the same views is Saudi Oil Minister Ali Al Naimi, who says Saudi Arabia’s economy should not depend wholly on oil production and exports because of the volatility of the international market, and should instead develop new industries to support economic growth. “Oil, as we all know, is volatile in terms of prices and production rates. For example, during the second half of 2008, prices dropped from $147/b to $35/b. At the same time, the kingdom’s production slowed from 9.5 mbpd to 8 mbpd,” Naimi says. Naimi says that although Saudi Arabia produces “numerous” raw materials such as oil, gas, petrochemicals and minerals, that has not been accompanied by an increase in the production of related secondary and finished products. Naimi says Saudi Aramco is currently building a number of new refineries, and that all Saudi sectors are participating in this endeavour, especially small and medium sized companies. He cites as an example the petrochemical complex, which Saudi Aramco and Dow have started to build in Jubail. This complex, he says, includes 26 manufacturing units and is considered one of the world’s largest integrated petrochemical facilities. Diversification into petrochemicals has become a cornerstone of the Saudi state oil company’s strategy since Al Falih was appointed chief executive in November 2008. The move has followed aggressive expansion of Saudi Aramco’s refining operations – a petroleum industry sector that the world’s largest oil exporter is well-placed to dominate. Meanwhile, Saudi Aramco’s sustainable production capacity will rise to 12.9 mbpd once the Manifa heavy oil field development is completed, but the state-owned giant intends to relax production from some of its older reservoirs to achieve maximum recovery rates, Al Falih says. The development of the offshore Manifa oil field is the last of Saudi Aramco’s planned capacity expansion projects and is being brought on stream in two phases. The first 500,000 bpd increment is due in June 2013, rising to 900,000 bpd in 2022. With the Manifa increment, Saudi Aramco will maintain its total production capacity at 12 mbpd, a number that Al Falih says is nominal. “First of all when we talk about a capacity of 12 mbpd, you are talking nominally. That does not mean that we cannot produce 12.5 mbpd. When we set a maximum sustained capacity, it does not mean that is the production ceiling when we fully open the valves. Every well we have is choked. There is a production level that we try to shoot for that allows us ultimate maximum recovery from that area from which the well is drawing crude oil,” Al Falih says. “With time, we reduce production from certain areas of the reservoir and we move to fresh or virgin fields so that we maintain economically optimum production over the long term,” he explains. Some of our older reservoirs that have been going for 50-60 years at certain production levels need to be relaxed at some point or another, because they are more expensive to produce than our less mature reservoirs,” he adds. The Khurais field, for example, has capacity of 1.2 mbpd, Al Falih says. “Today, Khurais can produce for a year or more at 1.4 mbpd, both from the wells and processing facilities. The 1.2 mbpd is when you start having water ingress, which we do not. We have zero water cut in Khurais today,” he says. “If I tell the head of our upstream to maximise Khurais, he can easily do 1.4 mbpd in 2012. Ultimately, when Manifa comes on stream, we will be relaxing some of the production that is available today from some of our mature reservoirs so that in 50 or 60 years we will have the ultimate recovery rates that we aim for and which we would not have if we kept producing at maximum rates from some of the more mature reservoirs,” he says. Saudi Arabia’s total production capacity currently stands at 12.5 mbpd, including the neutral zone shared with Kuwait. Meanwhile, commenting on recent remarks by Ali Naimi while in Durban, South Africa, that total output had topped 10 mbpd last November, Al Falih says that Saudi Arabia’s production includes Aramco’s production and the production of other entities. “We are not the only producer in the kingdom. There is SaudiChevron and there is AGOC and our production from the Abu Safah field, which is shared with Bahrain.. The figures that the minister mentioned could also include other liquids, such as condensate. It is not fair for me to try and dissect a number that was mentioned without me being there and without knowing the full context. 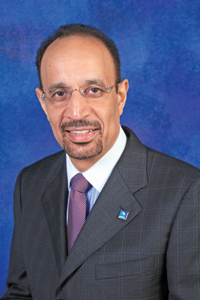 I can confirm to you that Aramco’s production has recently been significantly above 9 mbpd despite the seasonal decline of crude burning,” Al Falih says, referring to the volumes of crude oil used for power generation in the kingdom. “There have been varying figures for the volume of crude oil burn in Saudi Arabia, which tends to vary seasonally and is higher during the hot summer months. I have seen 900,000 bpd and 1 mbpd, which are absolutely incorrect. I believe 500,000 bpd is in the range of the annual average crude oil being burned for power generation,” Al Falih continues. The Aramco boss has said previously that sustained high consumption would impact the kingdom’s crude oil export volumes in the future. “Today if you look at our total energy consumption in barrels, oil equivalent (boe), it is in the range of 4 mboepd, give or take a couple hundred thousand. About 50 per cent of it is gas-based. This includes feedstock into petrochemicals, some of it is LPG, some of it is ethane, some of it is natural gasoline which is a form of naphtha, but it is all derived from gas,” Al Falih explains. “Of the other 2 mbpd, a lot of it goes into refined products and there is the 500,000 bpd of crude that goes into utility applications. I believe that what I said was that consumption will double by 2030 to 8.2 mbpd if we do absolutely nothing,” he says. Saudi Aramco also has conceptual estimates of its tight and shale gas reserves but has not yet booked recoverable reserves until it completes an assessment of its unconventional gas resources, Al Falih says. “We have numbers that geologists present to us, but they are still conceptual estimates. We really do not have booked recoverable reserves in terms of unconventional resources, because until you can know with certainty the resource base and drill enough wells to know the reservoir characteristics, and whether it is homogeneous or heterogeneous, and more importantly until you prove that it can be produced commercially, you cannot book them,” Al Falih says. “So what we have now are conceptual resource estimates. We know the resource base is there, but how much it is and when will we be able to put it down as a commercially recoverable reserves, we have some more work to do. I have mentioned before that our resource base is in the hundreds of tcfs,” he adds.